The Kartarpur Corridor (Urdu: کرتارپور راہداری‎, Punjabi: ਕਰਤਾਰਪੁਰ ਲਾਂਘਾ) is a proposed border corridor between the neighbouring nations of India and Pakistan, connecting the Sikh shrines of Dera Baba Nanak Sahib (located in Punjab, India) and Gurdwara Darbar Sahib Kartarpur (in Punjab, Pakistan). Currently under planning, the corridor is intended to allow religious devotees from India to visit the Gurdwara in Kartarpur, 4.7 kilometres (2.9 miles) from the Pakistan-India border, without a visa. The Kartarpur Corridor was first proposed in early 1999 by the prime ministers of Pakistan and India, Nawaz Sharif and Atal Bihari Vajpayee, respectively, as part of the Delhi–Lahore Bus diplomacy. On 26 November 2018, the foundation stone for the Kartarpur corridor was laid down on the Indian side. Two days later the foundation stone for the corridor was laid down on the Pakistani side. The corridor will reportedly be completed before the 550th birth anniversary of Guru Nanak Dev in November 2019. The prime minister of India, Narendra Modi, compared the decision to go ahead with the corridor by the two countries to the fall of the Berlin Wall, saying that the project may help in easing tensions between the two countries. However, Indian Army chief Bipin Rawat said on 28 November 2018 that Kartarpur should be viewed in "isolation" and not linked to anything else, adding that it was a unilateral decision. Currently pilgrims from India have to take a bus to Lahore to get to Kartarpur, which is a 125 km journey, despite the fact that people on the Indian side of the border can physically see Gurdwara Darbar Sahib Kartarpur on the Pakistani side. An elevated platform has also been constructed for the same on the Indian side, where people use binoculars to get a good view. The first guru of Sikhism, Guru Nanak, founded Kartarpur in 1504 CE on the right bank of the Ravi River and established the first Sikh commune there. Following his death in 1539, Hindus and Muslims both claimed him as their own and raised mausoleums in his memory with a common wall between them. The changing course of the Ravi River eventually washed away the mausoleums. A new habitation was formed, representing the present day Dera Baba Nanak on the left bank of the Ravi river. During the 1947 partition of India, the region was divided between India and Pakistan. The Radcliffe Line awarded the Shakargarh tehsil on the right bank of the Ravi River, including Kartarpur, to Pakistan, and the Gurdaspur tehsil on the left bank of Ravi to India. After partition, it is believed that Indian Sikhs would go over to Kartarpur informally, crossing a bridge on the Ravi river which joined Dera Baba Nanak with Kartarpur Sahib. This bridge was eventually destroyed in the Indo-Pakistan war of 1965. In 1948, the Akali Dal demanded that India should acquire the land of the gurdwaras in Nankana Sahib and Kartarpur. The demands persisted till 1959, but the Punjab state government controlled by Indian National Congress advised against any modification of the boundary fixed by the Radcliffe Award. In 1969, on the occasion of the 500th birth anniversary of Guru Nanak, prime minister Indira Gandhi promised to approach the Pakistan government for a land-swap so that Kartarpur Sahib could become part of India. None of this materialised. However in September 1974, a protocol was agreed between India and Pakistan for visits to religious shrines. Around 2005, the protocol was updated by increasing the number of visits and the number of sites. However, Kartarpur was never included among the sites included in the 1974 protocol. According to the Indian Ministry of External Affairs, India had requested for its inclusion but it was not agreed to by Pakistan. Gobind Singh, the caretaker of the gurdwara at Kartarpur, said the gurdwara had "remained shut from 1947 to 2000". According to Akali leader Kuldeep Singh Wadala, the gurdwara had been abandoned till 2003. It served as a cattle shed for the villagers and its lands were taken over by share-croppers. Since 2003, however, the Pakistani government has reportedly taken initiatives for the upkeep of Sikh religious shrines. During the tenure of prime ministers Nawaz Sharif and Atal Bihari Vajpayee, the opening of Kartarpur border crossing was first discussed in 1998. 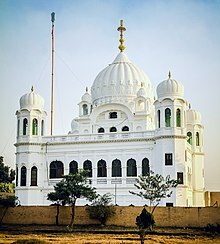 After further discussions during the 1999 bus diplomacy, Pakistan renovated the Kartarpur Sahib gurdwara, and made it available for viewing from the Indian border. The tensions arising from the Kargil War put paid to the India–Pakistan relations. However, it was reported that General Musharraf gave a 'green signal' for constructing a corridor, according to the Pakistan Gurdwara Prabandhak Committee chairman Lt.-Gen. Javed Nasir. Manmohan Singh, during his first term as the prime minister of India, also tabled the issue in a speech in Punjab in 2004. The 'composite dialogue process' between India and Pakistan initiated in 2004 also discussed access to Kartarpur via an Amritsar–Lahore–Kartarpur road link. In 2008, the Indian foreign minister Pranab Mukherjee raised with his Pakistani counterpart S. M. Qureshi the idea of "visa-free travel" to Kartarpur. There was apparently no official response, but privately, Pakistan began to express its openness to the Sikh community. However, even up to 2012, the Indian government had no response. The stalled relations between the countries were apparently to blame. On 20 June 2008, at a press conference in Dera Baba Nanak arranged by Akali leader Kuldeep Singh Wadala, John W. McDonald, a former American ambassador and founder of Institute for Multi-Track Diplomacy, called for "a peace corridor, a peace zone" connecting shrines on both sides of the border. On 28 June 2008, the Indian foreign minister at the time, Pranab Mukherjee, said that the Indian government would carry out a feasibility study for the peace corridor. However, since the 2008 Mumbai attacks took place, the relations between India and Pakistan nosedived and the initiative appears to have died. Members of the Sikh community in Washington DC worked with the Institute for Multi-Track Diplomacy to carry out an independent feasibility study. In August 2010, their report titled "Kartarpur Marg" was released by Surinder Singh and the Institute. According to the report, the cost of the corridor would be 17 million US dollars, which the Sikh diaspora agreed to raise. The report had said that it would cost India $2.2 million and Pakistan $14.8 million. In November 2010 the Punjab state legislative assembly unanimously passed a resolution in favour of an international passage between the two sites and forwarded it to the Indian Union government on October 1, 2010. In August 2018, Punjab tourism minister Navjot Singh Sidhu attended the Pakistani prime minister Imran Khan's inaugural ceremony, and he was told by the army chief Qamar Javed Bajwa of Pakistan's willingness to open the Dera Baba Nanak–Kartarpur corridor on Guru Nanak’s 550th birth anniversary. Given the clear time frame, this set the ball rolling. In August 2018, another resolution related to the corridor in the Punjab Vidhan Sabha was moved by chief minister Amarinder Singh, which was passed unanimously. Following this the government of Punjab decided to approach the prime minister of India related to the opening of the corridor. In 30 October 2018, a group of Sikh Americans sought the Prime Minister of India's for help in opening the corridor. In November 2018, the Indian Cabinet approved the plan to set up the corridor and appealed to Pakistan to do the same. The Pakistani foreign minister S. M. Qureshi responded by tweeting that Pakistan had "already conveyed to India" that it would open a corridor. On 26 November 2018, Indian vice president, Venkaiah Naidu, laid the foundation stone of the Dera Baba Nanak–Kartarpur Sahib Corridor at Mann, a village in the Gurdaspur district of Punjab, India. On 28 November 2018, the prime minister of Pakistan Imran Khan, laid the foundation stone for the Kartarpur corridor near the Narowal district of Punjab, Pakistan. Two central ministers of India, Harsimrat Kaur Badal and Hardeep Singh Puri were present at the event in Pakistan. In addition, Navjot Singh Sidhu and member of the Parliament from Amritsar, Gurjeet Singh Aujla were also present. The Complex will have an international standard hotel, hundreds of apartments, two commercial areas and two car parking, Border Facility Area, a power grid station, tourist information Centre and several offices. According to a presentation given by a US firm, the survey for the corridor has been completed by the Pakistan government. The design and land acquisition are to take place in December. The construction of the corridor is expected to be completed by 1 November 2019, in time for the birth anniversary of Guru Nanak on 12 November 2019. Even though the point at which the corridor will cross the border has not yet been decided, there is expected to be an 800-metre (2,600-foot)-long bridge over the Ravi River. The construction includes a 'boarding terminal' from where shuttle buses will take the pilgrims from India to Kartarpur. There will be temporary accommodations and tents for the pilgrims. There is an expectation that the pilgrims will need to obtain special permits, though not visas, for making the trip, and they will need to undergo biometric checks. The Indian government has shown its concerns that the corridor might be used by Pakistan to undermine India's security, in the interest of the Sikhs' desire for access to the site. The day before the announcement, there was a grenade attack on a Nirankari meeting in Amritsar. Punjab's chief minister Amarinder Singh has blamed the Pakistan's Inter-Services Intelligence for the attack. He stated that the Punjab government has neutralised 15 terror modules in the last 18 months. India also has concerns about the Kartarpur gurdwara being used for Pakistani supported pro-Khalistan separatist movement propaganda. It has already shared with Pakistan evidence of pro-Khalistan posters and sloganeering at Pakistan's gurdwaras. Some of Pakistan's Shiromani Gurdwara Parbandhak Committee office-bearers, who are known to be supporters of the Khalistan movement, are among the promoters of the Kartarpur corridor. Security officials point out the recent uptick in Sikh separatist violence in Punjab, which add to the concerns. Lahore-based historian, Fakir S. Aijazuddin, characterised it as a "unique experiment" in cross-border ties between India and Pakistan. The universality symbolised by Guru Nanak can bring the people of all religions together. ^ "Kartarpur Corridor: Visa-free pilgrimage route a good confidence-building measure, but thaw in India-Pakistan ties still a mirage - Firstpost". www.firstpost.com. Retrieved 2018-12-02. ^ a b c SGPC demands government to take up Dera Baba Nanak-Gurdwara Kartarpur Sahib corridor issue with Pakistan, The Times of India, 3 July 2012. ^ a b c d e "The long road from Kartarpur to peace". The Indian Express. 2 December 2018. ^ a b "Pakistan prime minister to lay foundation stone for Kartarpur corridor on Wednesday - Times of India". The Times of India. Retrieved 2018-11-28. ^ "Pakistan PM Imran Khan to lay foundation stone of Kartarpur corridor today". Hindustan Times. 28 November 2018. ^ "Should See Pak's Kartarpur Initiative In Isolation: General Bipin Rawat". NDTV News. 28 November 2018. ^ "Kartarpur corridor should be seen in isolation: General Rawat". ANI. 28 November 2018. ^ "A shrine so near, yet so far: Their prayers travel across border, they can't". The Indian Express. 2017-08-15. ^ Parashar, Sachin (23 November 2018). "Cabinet clears corridor for Kartarpur up to Pakistan border". The Times of India. ^ Haidar, Suhasini (2018-11-25). "Kartarpur marks a fresh start". The Hindu. ISSN 0971-751X. Retrieved 2018-12-11. ^ "Guru Nanak Sahib". Sgpc.net. Archived from the original on 2012-02-18. Retrieved 2012-02-10. ^ Jha, Rival Versions of History 1996, p. 81: Mountbatten sent a query to the Secretary of State for India, Lord Listowell, asking what 'other factors' might mean. Listowell... replied that these were entirely for the Punjab Boundary Commissioners to decide. However, he said, 'other factors must include the location of Sikh shrines'. This looks very much like a directive to the Radcliffe Commission. Sir Cyril certainly paid heed to it, but not unduly at Pakistan's expense." ^ Maini, Tridivesh Singh. "Punjab: Can It Be a Bridge to Peace Between India and Pakistan?". ORF. Retrieved 2018-12-11. ^ a b Access first promised in 1969, The Tribune, 28 November 2018. ^ a b Devirupa Mitra, At Kartarpur Ceremony, Imran Khan Emphasises Cooperation, Says Army on 'Same Page', The Wire, 28 November 2018. ^ a b c Parliamentary Debates: Official Report, Council of States Secretariat, 2012, p. 63 : "In 2005, Government had proposed to Pakistan the inclusion of Kartarpur Sahib in the list of shrines under the bilateral 'Protocol on Visits to Religious Shrines-1974. During the meeting between External Affairs Minister and the Foreign Minister of Pakistan on June 27, 2008 it was also proposed to Pakistan side that a stall (?) team from India could visit Pakistan to discuss the modalitics for visa free travel through a corridor to Kartarpur Sahib Gurudwara in Pakistan. However, no response has been received from Pakistan side till date." ^ Footprints: The borders of man, Dawn, 18 September 2018. ^ a b Pakistan open to ‘visa-free’ Sikh pilgrimage, The Indian Express, 16 April 2008. ^ a b Kartarpur to lessen Pakistan-India tension, The News International, 27 November 2018. ^ Pakistan gives nod to Kartarpur Sahib Corridor, agrees to open border next year, One India, 23 November 2018. ^ "Kartarpur Corridor, All You Need To Know: Top 10 Facts". NDTV.com. Retrieved 2018-12-06. ^ a b c New Delhi, Islamabad Jostle for Credit as Kartarpur Sahib Corridor Gets Green Signal, The Wire, 22 November 2018. ^ "TeriSikhi welcomes Pakistan offer to open the Kartarpur Sahib corridor for Sikh pilgrims". Punjab Newsline Network. San Ramon, California. 27 June 2010. Archived from the original on 2011-01-01. ^ "Pakistan ready for corridor". The Times of India. Retrieved 23 August 2018. ^ "The Tribune, Chandigarh, India - Punjab". www.tribuneindia.com. Retrieved 2018-12-11. ^ "Feasibility study on corridor to Kartarpur Sahib: Mukherjee". Outlook India. 28 June 2008. ^ Eddie Walsh (23 August 2011). "Bridging the Sikh Divide". The Diplomat. ^ Singh, Surinder (2010-08-08). Kartarpur Marg. Institute for Multi-Track Diplomacy. ISBN 9780615400044. ^ "Blueprint for peace corridor between India and Pakistan". www.thefreelibrary.com. ANI (Asian News International). 20 November 2009. Retrieved 2018-12-11. ^ "NRIs pitch for early construction of Kartarpur Sahib Corridor". The Indian Express. 2011-01-06. Retrieved 2018-12-11. ^ "Dera Baba Nanak- Kartarpur Sahib corridor to cost $17 million: Institute of Multi Track Diplomacy report - Times of India". The Times of India. Retrieved 2018-12-11. ^ a b "Cabinet clears corridor for Kartarpur up to Pakistan border". The Times of India. 23 November 2018. ^ Bagga, Neeraj (27 November 2011). "'Set up Dera Baba Nanak-Kartarpur corridor'". Tribune India. ^ "Navjot Singh Sidhu justifies hugging General Bajwa, says he felt love from Pakistan side". The Times of India. Retrieved 23 August 2018. ^ "Punjab Vidhan Sabha passes unanimous resolution demanding corridor to Kartarpur Sahib". The Indian Express. 2018-08-28. Retrieved 2018-12-11. ^ "Sikh-Americans seek PM Modi's help over for Kartarpur Sahib Corridor". The Indian Express. 2018-10-30. Retrieved 2018-12-11. ^ "Kartarpur Corridor Can Be Symbol Of Peace Between India, Pak: Residents". NDTV.com. Retrieved 2018-11-28. ^ Iqrar, Agha (18 March 2019). "Design and map of Gurdwara Darbar Sahib Kartarpur Corridor Complex". dnd.com.pk. Retrieved 20 March 2019. ^ a b c Suhasini Haidar, Amidst euphoria amongst pilgrims, officials worry about Kartarpur logistics, The Hindu, 29 December 2018. ^ Guru Nanak Jayanti, Public Holidays Global, retrieved 2 December 2018. ^ Shivam Vij, Why Kartarpur Sikh corridor is a very big deal for India-Pakistan relations, The Print, 23 November 2018. ^ I can’t go to Pakistan when terrorist acts are being carried out here, says Capt. Amarinder Singh, The Hindu, 26 November 2018. ^ Suhasini Haider, What does Kartarpur signify for India-Pakistan ties?, The Hindu, 1 December 2018. Images: Gurdwara Darbar Sahib in Kartarpur, Geo TV, 28 November 2018. This page was last edited on 23 March 2019, at 15:46 (UTC).